Enjoy family time at one of these Southern Indiana Easter hunts. After the long Indiana winter months, everyone is hunting for the first signs of spring. 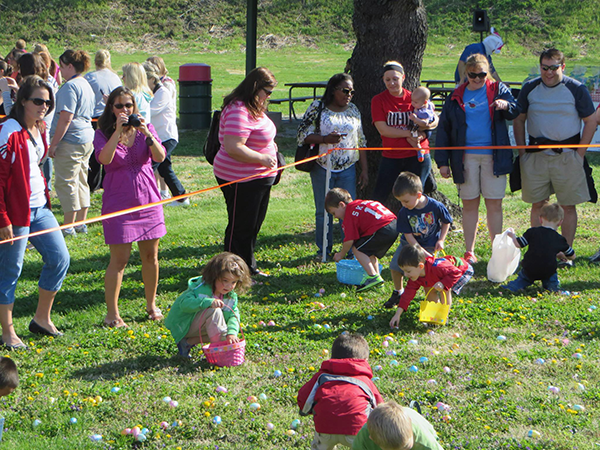 812 searched for some of the biggest Easter egg hunts in the area to bring your family. Whether you’re looking for sugar sweet prizes or the thrill of the hunt, these local events are hidden treasures. Prizes: All the eggs are filled with an assortment of candy. The event: Kids in two age groups hunt for an equal opportunity to find eggs. Ken Conklin, marketing and programming coordinator for the Clarksville Parks and Recreation Department, can’t remember a time when the town didn’t have an annual hunt. “This year we want to add more entertainment for the kids. Like an egg-roll event or bounce houses,” Conklin says. Prizes: Most of the eggs are filled with candy. Some eggs contain a special ticket inside that is redeemed for one of eight basket prizes filled with a variety of small gifts. The event: Started in 2011, the Jeffersonville Parks Department annual hunt keeps growing. “I hope to see the event continue to bring families together,” Paul Northern, Director of Parks and Recreation says. Last year, the eggs were filled, taped and dropped from a helicopter over Vissing Park. “Our insurance company questioned it a little bit, but in the end they went with it. The kids had fun with it, and we had no issues,” Northern says. Insider Tip: The event brings three to four thousand kids to Vissing Park. Northern recommends those interested to pre-register for the event on the Jeffersonville Parks and Recreation website and Facebook page. Prizes: There is a prize assortment in each egg, from gift certificates for Joe Huber’s restaurant to candy. The event: The Huber Family Farm tradition dates back to 1843, and the eighth generation of Huber’s now lives in Starlight. Although the Easter egg hunt does not date back to the farm’s origins, Terra Huber-Mahan, director of Sales and Marketing, remembers it as a family tradition. “We pride ourselves on being ‘Kentuckiana’s’ largest Easter egg hunt event,” Huber-Mahan says. The hunt begins at 3 p.m. on Easter Sunday, with kids separated into two age groups. Insider Tip: A buffet follows the hunt in Joe Huber’s Barn Private Facility. “We always serve a traditional country platter,” Huber-Mahan says. Reservations are required for the buffet.